Note: This feature is exclusive to the Pro and Advanced account subscribers. Along with selling Partner Vendor Fulfilled products and Self Fulfilled products, the option is also provided to sell Digital Download products through the photographer's site. This allows the photographer to sell Digital Downloads of their images and videos to their client. The photographer is able to set the price for the Digital Download. They can also set the parameters of the download such as controlling the size of the image delivered to the client or controlling the number of images the client is able to downloading with the purchase of each product. The photographer is also able to choose the license that applies to the Digital Download product. The license defines, to the purchaser, their rights for using the photo or video (e.g. printing, posting on social media, commercial use, etc.). The photographer is also able to create their own custom licenses. There are many creative ways of selling your images and videos as digital products, such as iPhone backgrounds, Facebook profile photos/videos, stock photography, promotional products, and so on. 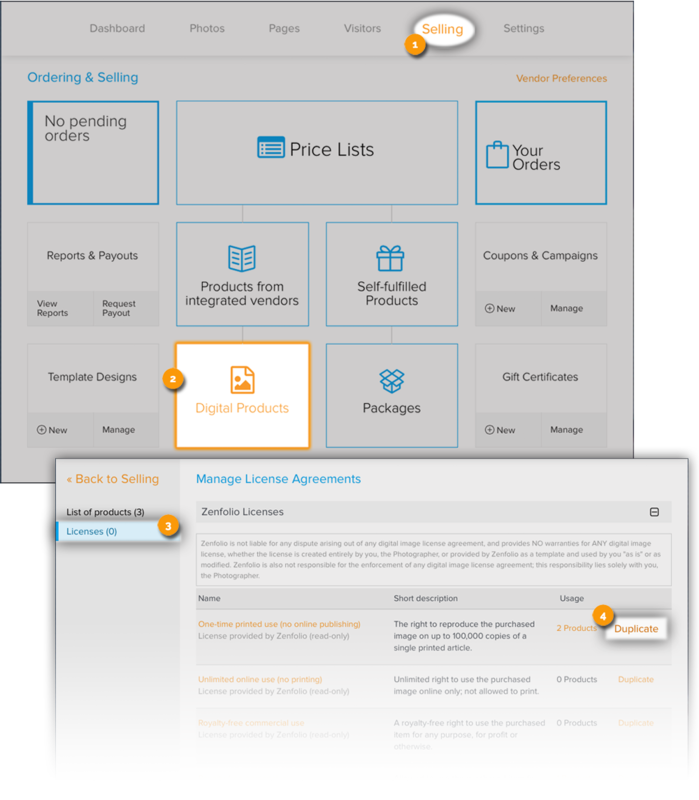 To sell Digital Products you need to specify the license agreements that you will be using, define digital products you are offering for sale, and set your prices. 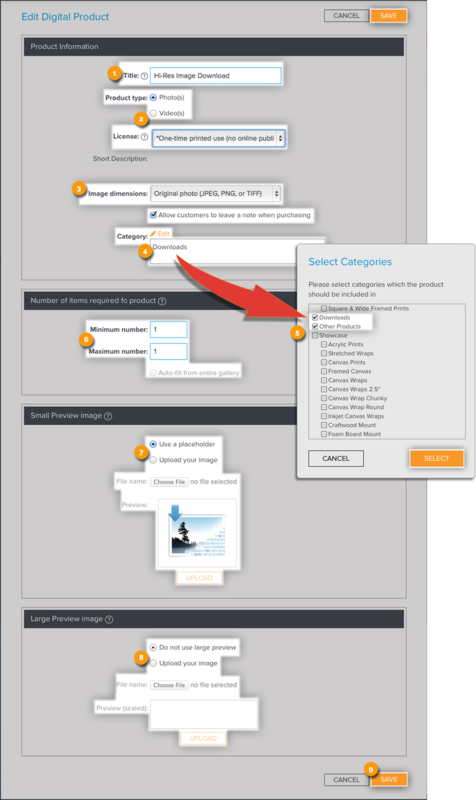 When creating a digital product you have 6 sizing options to choose from for your photos. 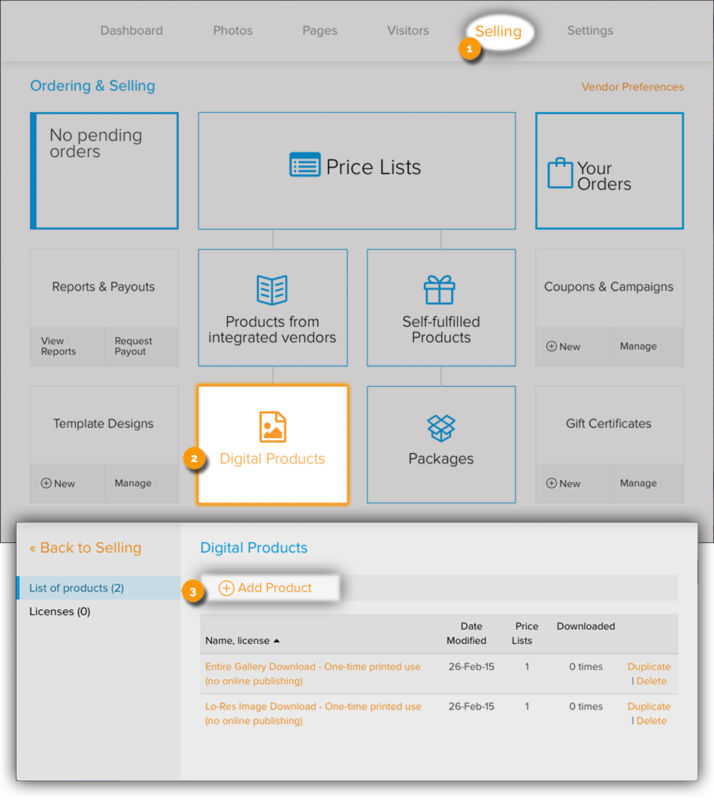 Once you have created digital products you can add them to your price lists. In the Dashboard, click Selling from the Dashboard menu. Click Digital Products from the menu on the left. Click Create New. A new page will load. Type a Title for your Digital Product and from the drop-down menu select the desired license for your digital product. Title, license, and image dimensions are displayed when the product is added to the Shopping Cart. Product titles should be descriptive of the downloaded image, such as: Full size original file, iPhone Background, Low Resolution Web Image, etc. Select the Product Type. The Digital Product can be either Photos or Videos. Then choose the license for the product. Select the Image dimensions from the drop-down menu and check or uncheck Allow customers to leave a note when purchasing as necessary. There are 6 image sizes: original, high resolution, medium resolution, low resolution, specific dimensions and largest dimension. For Category, click Edit. A Select Category window will open. Choose the category or categories where you would like the product to appear in. Select as many categories options as necessary and click Select. For Small Preview Image, click Upload your image (highly recommended). Click Browse and select a photo from the files on your computer. Image can be up to 244 x 214 pixels and will be displayed 'as is' without any auto resizing. The file should be a JPG, GIF, TIFF, or PNG. Note: If you don't upload an image then the default 'digital product' icon will be used as a placeholder. For Large Preview Image, click Upload your image (highly recommended). Image can be up to 900 x 480 pixels and will be displayed 'as is' without any auto resizing. The file should be a JPG, GIF, TIFF or PNG. Click Save. 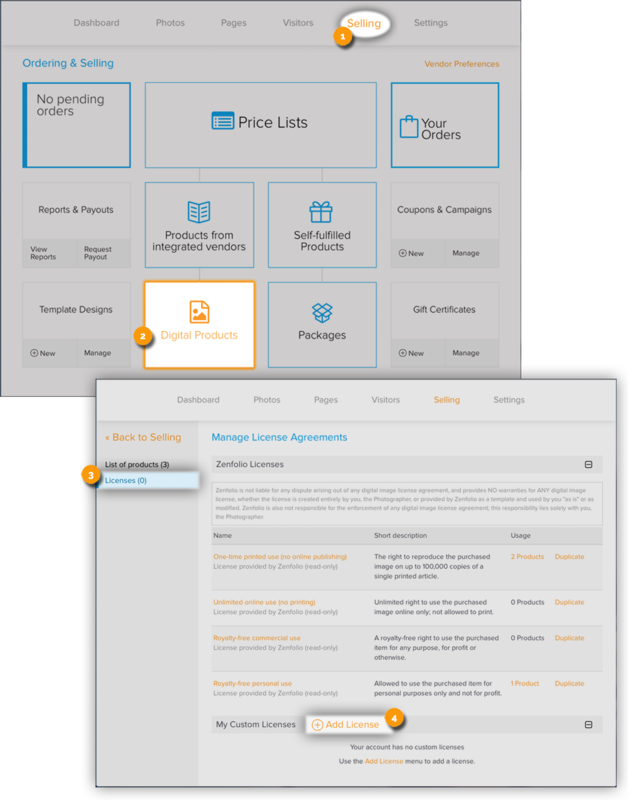 Your product will be added to your Digital Product list. The only difference between creating a Digital Product for your Videos and your Photos occurs in the 2nd and 3rd steps of Creating your Digital Products. Select Video(s) as the Product Type. Then choose the license for the product. 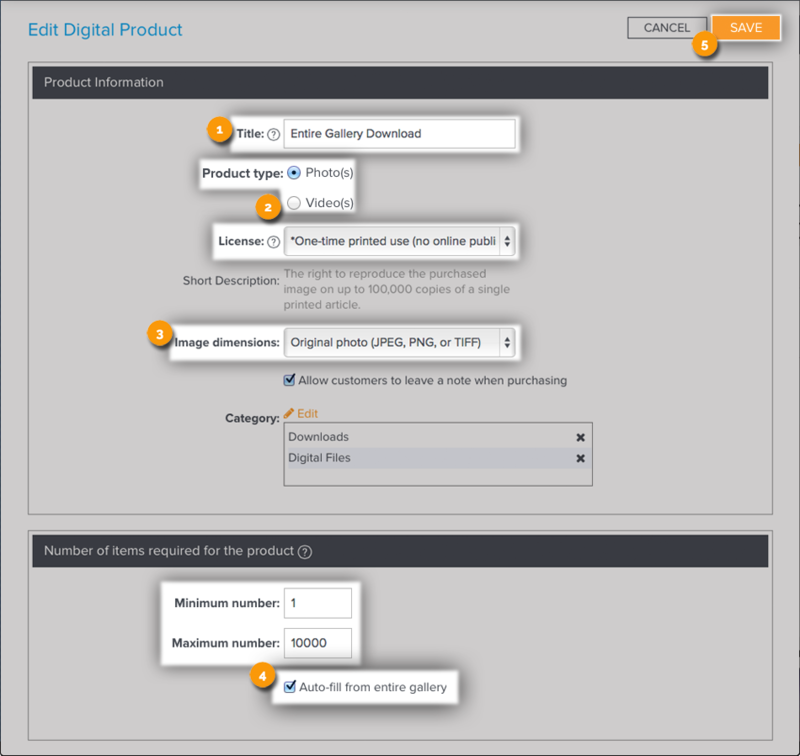 All of the same steps apply when creating a Digital Product for an entire gallery download - however entering the Number of items required for the product is extremely important as the maximum number of items should meet or exceed the number of photos that are in the galleries that you intend to sell in their entirety. 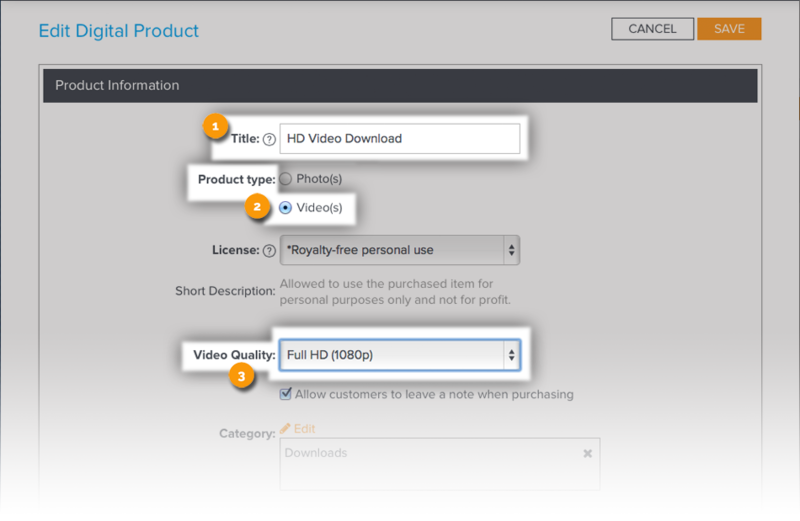 Select the Product Type and License - The Digital Product can be either Photos or Videos. determine the Number of items required for the product. The maximum numbers should only exceed 1 if you are selling a product that requires more than one photos (ex: an download of an entire gallery should exceed the number of photos you normally have uploaded to any one gallery). To sell Digital Products you need to specify the license agreements that will apply to each of your Digital Products. A license is defined by name, short description, and full license text, usually written by a legal expert. 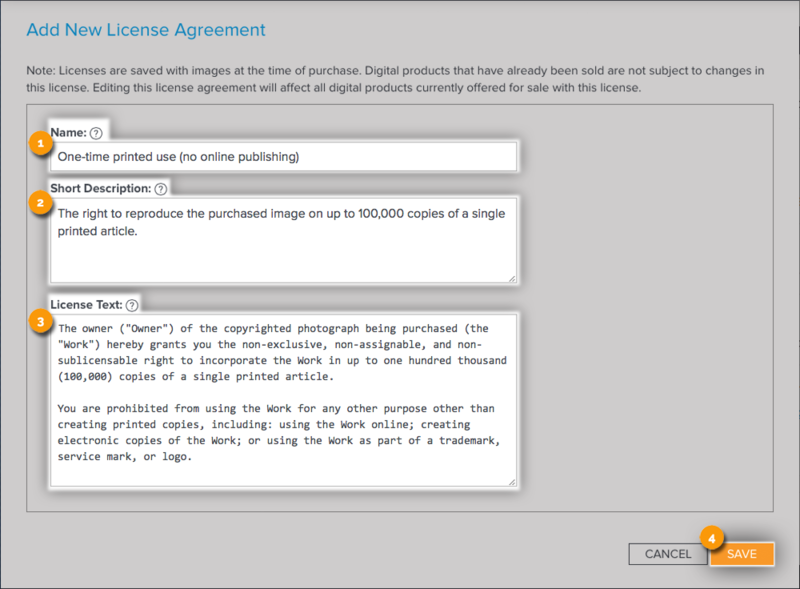 Zenfolio has prepared 4 pre-defined licenses for you that can be applied to most common uses. These license agreements can be used 'as is' or customized to meet your specific needs. Custom created licenses can be edited or deleted at any time from the Licenses page. One-time printed use (no online publishing). Allowing the right to reproduce the purchased image on up to 100,000 copies of a single printed article. Unlimited online use (no printing). Allowing unlimited rights to use the purchased image online only; not allowed to print. Royalty-free commercial use. Allowing royalty-free rights to use the purchased image for any purpose, for profit or otherwise. Royalty-free personal use. Allowing use of the purchased image for personal purposes only and not for profit. Note: Zenfolio is not liable for any dispute arising out of any digital image license agreement, and provides NO warranties for ANY digital image license, whether the license is created entirely by you, the Photographer, or provided by Zenfolio as a template and used by you "as is" or as modified. Zenfolio is also not responsible for the enforcement of any digital image license agreement; this responsibility lies solely with you, the Photographer. Click Digital Products from the Selling menu on the left. Click Add License next to My Custom Licenses. A new page will load. Type a Name for your license in the text field provided. The name appears in the Shopping Cart and order details. Type a short description in the text box provided. Helps customers understand the license terms without reading the full license text. It appears in the Shopping Cart. Type the License Text in the text box provided. Note: Customers are asked to read and agree to the terms of the license agreement at the time of the purchase. The text of the agreement is displayed in the Shopping Cart during checkout. License agreements are saved with products at the time of purchase and can be viewed later from the Order Details page. Click Save and your license will be added to the My Custom Licenses section of the Licenses page. Under Zenfolio Licenses click Duplicate. A new page will load with the provided license information. Type a new Name in the text field provided (optional). This name appears in the Shopping Cart and order details. Type a new Short Description in the text box provided (optional). Helps customers understand the license terms without reading the full license text. It appears in the Shopping Cart. Type a new License Text in the text box provided. You can sell a RAW file along with the Original photo. The RAW file will be included in the downloaded .zip file along with the original photo and the license agreement. 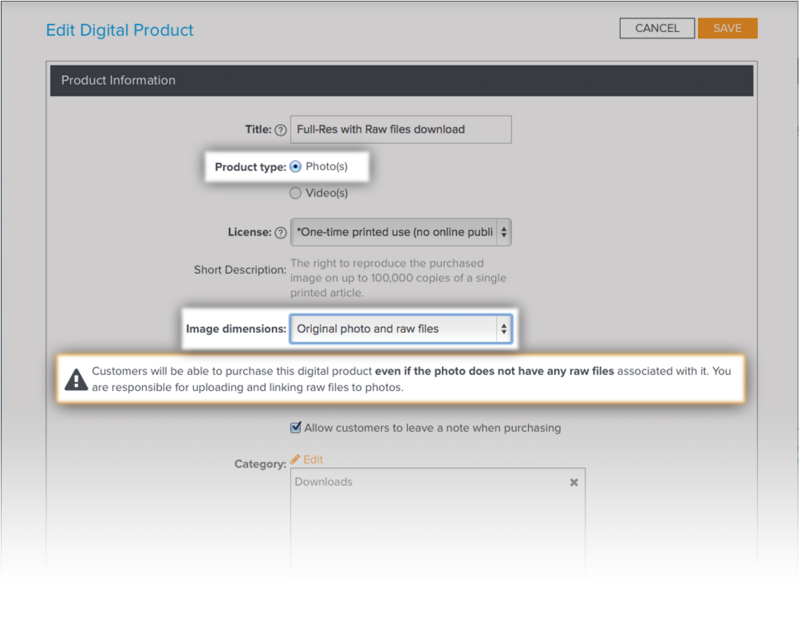 To set up a Digital Product to include a RAW file, the RAW file needs to be linked to the uploaded photo. All of the same steps apply when creating a Digital Product to include a RAW file but "Original photo and raw files" must be selected from the Image Dimensions drop list. Select Photo(s) as the Product Type. The Digital Product must be Photos as RAW files cannot be linked to videos. ​Please click here for more information on uploading and linking your RAW files!